Computing the costs for server-hosted workstations has relatively few steps that your IT department can quantify in cooperation with the equipment vendor. It is the computation of the possible savings that requires some thought. We’ll take each part of the challenge and break it down into values that most companies will experience. Costs for systems are driven by the manufacturer as cartridge and chassis options vary widely from vendor to vendor (see installment 3 for more clarification on this). Current Intel GVT solution provider information. Each company offers a variety of options that vary in cost. Cartridges. As appropriate for the number of workstations desired. Be sure to specify all storage options (hard disk, solid state disk, etc.) and the desired amount of system/graphics RAM. 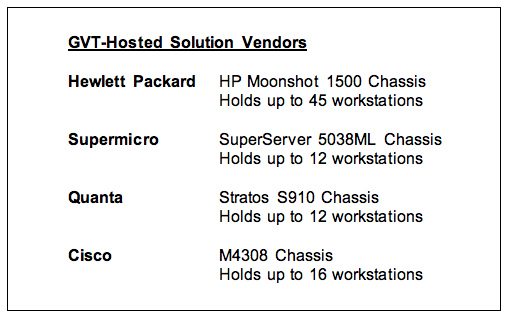 Note that some vendors support multiple workstations per cartridge. Chassis. 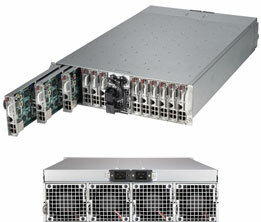 All parts, power supplies, rack mount kits, and power cables required for installation. Be sure to get a chassis that is large enough to hold the eventual number of workstation cartridges your company requires. Windows Server licenses. As required for the number of workstations desired. UPC power. Enough regulated uninterrupted power to supply a fully populated chassis full of cartridges (even if the chassis isn’t initially fully populated to begin with). Switch/rack gear. Any additional Ethernet switches and rack equipment required to mount and interface the chassis to the corporate network. Installation labor. If charged by the vendor. Remember when you are computing costs, that these are one-time transactional costs, not recurring ones. You'll need to consider these front-loaded costs in multiple scenarios for computing ROI values, as you'll learn a bit later. Workstation savings. If you implement server-hosted workstation architecture, you won’t have to buy expensive stand-alone workstations — this means you can use lower cost machines or even keep older machines on their desks. In some cases you may be able to stop purchasing desktop machines as users move towards tablet-style devices for their CAD work. Whatever savings you derive from not purchasing new CAD workstations for individual users will offset the cost of GVT-server hosted workstation systems. Work sharing savings. Will you be able to support more than one user with a single server-hosted workstation? Work sharing solutions such as multiple shifts, pools of home-based users in different time zones, and occasional-use executives are common scenarios where workstations may be shared. If a single server-hosted workstation supports multiple users, the hardware savings can add up quickly. Software savings. If multiple users can share server-hosted workstations, they can then share the licensed software on that workstation as well. Whatever sharing ratio you determine for hardware use should allow you to reduce software licenses. IT support savings. Supporting many workstations at several branch offices is much more IT intensive than supporting multiple server-hosted workstations located in an IT data center. Consolidating workstations to a centralized facility can reduce hardware support hours, as well as reduced travel and phone expenses. Reduced backup and security costs. Backing up data from user workstations is a laborious and bandwidth intensive process that can slow down WANs. Plus there is always the chance that backups don't happen if users move data to local devices on their own workstations. Contrast this with server-hosted workstations that reside in the data center where WAN bandwidth isn’t an issue and each device can be completely backed up each night. This scenario reduces IT time and reduces security costs because of fewer lost file/restore requests. Some of these savings will recur annually (such as IT support, backup, and security) while some will occur every few years (new workstation purchases). Based on your company’s policies for workstation purchases you should be able to tally up a savings profile for the first three years — the typical life of a workstation. Here’s the fun part: Interpreting the results! * Year one savings include annually recurring savings (see section above) and any hardware/software savings that may occur in the first year of implementation. ** 3 year savings include annually recurring savings (see section above) multiplied by three (3) and any hardware/software savings that may occur during the total 3 year time span of implementation. This total ROI yields a much better picture of how a server-hosted workstation implementation might look for your company since it computes return over the typically accepted lifespan of computer equipment (3 years). Now that you and your IT staff have a full understanding of how GVT hosted-workstations work and how you can analyze them, you can decide for yourself if it is an approach that makes sense for you and embark on testing if the results look promising. Yes, it will take some homework on your part, but you can get the whole process started by obtaining a hardware quote and making intelligent estimates for IT costs and projected savings based on your own experience.